The articles by Alexander Domrin and Ivan Marino about the Constitution of the Russian Federation and the 15th anniversary of its adoption hold the central place in the latest (No.1, January-February 2009) issue of “Representative Power – Century 21”. 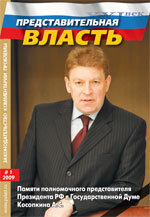 Other important topics include an interview with the Chairman of the State Duma Committee on Transportaion S.Shishkarev, articles by S.Komarov and A.Kosopkin on representation in the constitutional law, by V.Ivanov and A.Ivanov on Russian model of management of sustainable development, G.Cheremnykh on illegality of sales and purchases of vehicles by proxy, Yu.Golik on confiscation of property, V.Filipkov on mandatory health insurance, V.Sysoev on legal culture and A.Fesechko on compatibility of people. The issue also contains reviews by N.Korshunov (of a book “Property and Power” by F.Shamkhalov) and A.Lyubimov (of a book “Normography of Law-Making”). The issue ends with In Memoriam section about untimely deaths of the Representative of RF President in the State Duma A.Kosopkin and Professor F.Rudinsky.